When your puppy is young is the time to get her/him accustomed to anything and everything that we’ll want to do throughout his/her lifetime. It is very important that you spend time brushing your puppy’s haircoat daily. For all dogs a brush called a slicker brush is ideal – they have wire bristles that are very effective in removing loose hair. A comb is another good grooming tool especially for long-haired dogs. Brushing your puppy’s coat is important for many reasons. It increases the circulation to the skin which helps promote healthy skin and fur. It removes loose hair and this helps to prevent hairballs and blockages from hair. This also helps to decrease the amount of hair that you will find around your house. 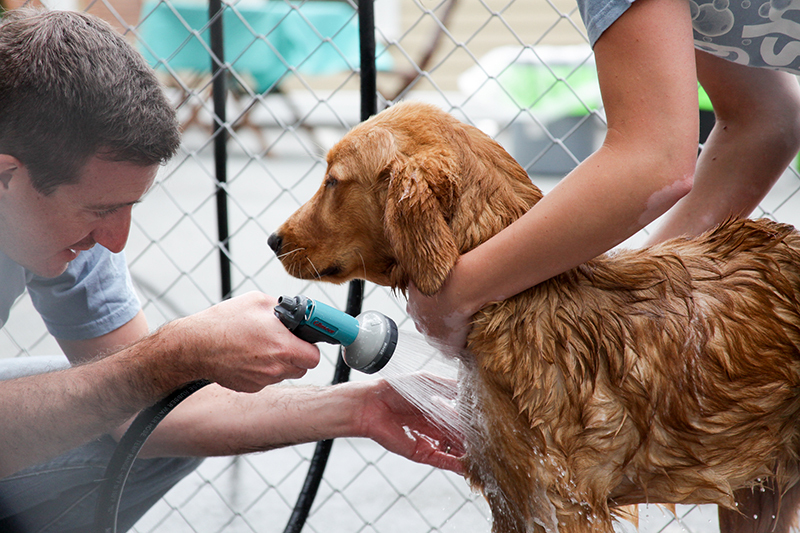 Routine bathing should be done with a dog shampoo only as they are specially formulated to meet your dog’s needs. Many routine grooming shampoos are available. Baths should not be given any more frequently than once every 4 weeks. Too frequent bathing will strip the skin of natural oils and lead to dry, flaky, itchy skin. Remember that rinsing away of shampoo residue is very important. Continue to rinse your pet for a few minutes after you are no longer able to detect shampoo residue. This is especially important for long-haired dogs. Although it may sound funny, you should get your puppy used to having his/her teeth brushed. The teeth should be brushed daily to twice weekly. Brushing with a non-fluoride paste is advisable as puppies will swallow the paste, unlike humans, and the fluoride can make them sick. Start with just your finger on your puppy’s teeth and gums. Try this when he/she is resting and peaceful instead of during playtime. You are more likely to be successful and your fingers will appreciate it! Once the puppy is used to your fingers, you can use some paste on your finger. Then you can move to a piece of gauze with paste. Finally introduce a brush with paste. While some people prefer a finger toothbrush that will slide right onto their finger, others like to use a regular brush – either is fine. Brushing action is the same as with our teeth – from the gumline down on the top teeth and from the gumline up on the bottom teeth. The insides of the teeth are often very difficult to reach. The tongue tends to “brush” them as well. So if you are only able to do the outside surfaces, that’s fine. The farthest back teeth are the most difficult to reach, but they tend to build-up tartar more quickly and therefore particular attention should be given to these teeth. Although this can be a difficult habit to establish with puppies – it is easier at a younger age. Persistence is the key as it is with many things in life!! The rewards that will be enjoyed by your pet include healthy, clean teeth and gums. Tartar build-up on the teeth is a source for bacteria and causes gum disease as well. Furthermore, you will appreciate your pet’s breath much more when it is fresh. Routine brushing, along with prophylactic dental cleanings, are the key to good oral hygiene with your pet. Nail trimming should also be initiated at a young age. Instruction will be given on this during your puppy’s health exam, as well as a complimentary nail trim. Then there is a little homework to do. Play with your puppy’s feet while he/she is resting or sleeping to get him/her accustomed to having the feet and toes touched and held. Alternate playing with the feet/toes with a belly rub, so that the puppy finds it more enjoyable. Hold your puppy frequently as if you are going to trim nails, then just let her/him go. Bring the nail trimmers out and get your puppy used to the sight and sound of them so that they do not cause stress whenever the puppy sees them. The first few trims, only do as many nails as the puppy will happily allow. Try not to make it a stressful event. Alternate each snip with a belly or ear rub, to start at least. With nail trimming remember to be aware of where the “pink triangle” or “quick” is – these are the blood vessels that supply the nail. The “quick” is easy to see in white nails but not so easy or even impossible in dark or black nails. Please do not let this stop you from trimming nails yourself. Unfortunately what happens if nails are not trimmed routinely is that the quicks will become longer and grow closer to the tip of the nail – then you are more likely to hit them!!!! So even if you cannot see the “quick”, frequent nail trimming is important. Trim ‘close to’ but never ‘into’ this sensitive area. If you do happen to get too close, it’s okay – becoming stressed will transfer to the puppy – remain calm. Unless you cut quite deeply into the “quick”, there is not likely to be a lot of bleeding. If bleeding does occur, place pressure on it and use one of the many commercially available products to stop the bleeeding. Kwik-stop powder is one of the easiest to use – we use this at Vetcetera. We do recommend that you have some on hand. Nails should be trimmed routinely every 3-4 weeks. Dogs have a much longer ear canal than humans. This makes them more prone to outer ear infections. While all dogs are at risk, this is especially true for dogs with long, floppy ears or with lots of hair around the ear canals. With a lack of air circulation and light in the ear canals, the ear canal is a dark, moist environment – bacteria and yeast love this type of environment!!! It is important to get your puppy used to having his/her ears examined. You should smell your puppy’s ears to get used to what is a “normal” odor for him/her. Get your puppy used to your fingers in his/her ear canal – only in the portion of the canal that you can see. Routine ear cleaning should be initiated at a young age. Instruction will be given to you on this at your first visit. Flush the ear canal with cleansing fluid and massage the ear gently at the base of the canal. Then let your puppy go and wait for the headshake and cleanser shower. Cleaning the ears every 4 weeks is generally sufficient. For dogs that swim a lot, a drying agent after swimming sometimes helps to decrease the occurrence of infection. Be careful during bathing to place cotton balls in the ears to prevent them from becoming water-filled. Remember that lots of praise for good behavior is important. Treats can also be given while you are attempting to introduce new habits. This does not have to be a food treat – it may be an ear or belly rub. We understand that new habits are not always easy to establish – it does take time and effort which in our busy lives is not always easy to find. But once the routines are established it takes only minutes a day to perform them. We’re sure your pet will enjoy the benefits of your time and effort… and will be healthier and happier because of it.